Siam Consulting Hua Hin Co., Ltd. 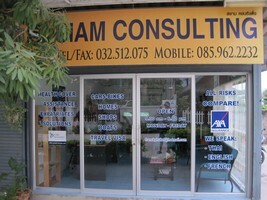 Established in Thailand since 2006 Siam Consulting Hua Hin offers insurance solutions to over 1000 clients. These insurance policies are designed for expatriates living in Asia up to the age of 70 inclusive. This insurance solution provides cover for expatriates for a minimum period of one year in Cambodia, Thailand, Indonesia, Laos, Malaysia, the Philippines, Taiwan, Vietnam, Singapore, Hong Kong and Vietnam. Specialized in health insurance we cover your expatriate insurance needs.Our knowledge of the country Thailand and Southeastasia, our assistance service is your guarantee of peace of mind. The growth in Thailand leads more and more people to come take their chance and work or set up their own company in this country or simply enjoy the quality of life for retired persons. The multiple risks your activity will face require counseling and expertise from a personnal broker Siam Consulting HuaHin is here to help you. Our Hua Hin office is located 250/129 soi 94 (200 m left side before railway)open from Monday to Friday from 9 am to 5 pm. We permanently seek the best solutions in terms of service and price.We are listening to your needs and their evolution through your expatriation. We are at your side for managing your claims and bring you 24h assistance. Have a nice stay in Thailand.